Model Manufacturing » DST – Entwicklungszentrum für Schiffstechnik und Transportsysteme e.V. The models used in the tests are mostly manufactured in the DST. As a customer you can also bring your own model, which will be equipped with the measurement sensors. On the other hand, the DST is also happy to build models on your behalf for other uses. The first step in model manufacturing is defining the construction method and material. Small models or models, which are only allowed to have a very low empty weight, are made of fibre-reinforced plastic. For this purpose, a negative mould is created into which the fuselage is laminated. Most models are made of Abachi wood (Triplochiton scleroxylon) which is very light and short-fibred. Rarely closed-pored model foam is also used. Both materials are ideal for machining. Using a the waterline plan, a blank is now built from coarsely pre-cut parts and clamped with the keel upwards in the large model milling machine. 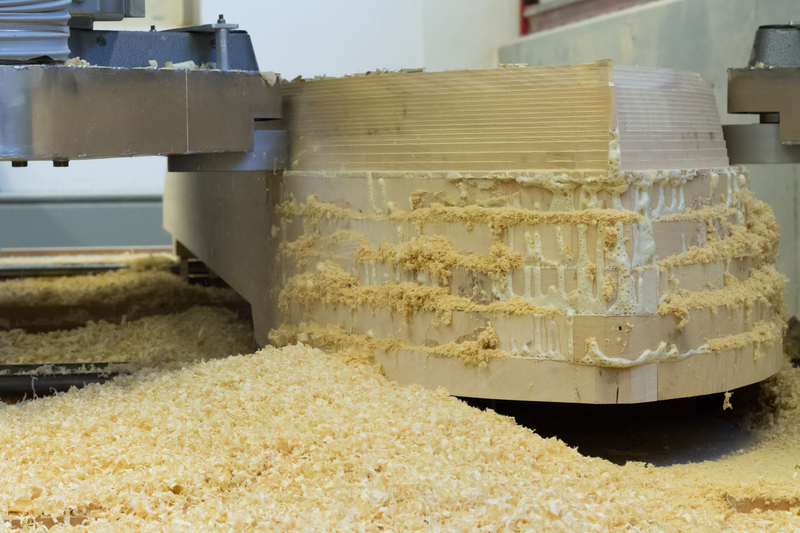 With the milling plan, in which the water lines are drawn at a distance of no more than 5 mm, the fuselage contour is milled out of the blank in horizontal planes. The milling machine can handle models up to a width of 1.6 m. The model length can be arbitrary, as the models can be composed of several sections separated by transverse bulkheads if necessary. The milling machine produces a raw model with a stepped contour. The inner edges of the steps represent the exact model surface. The protruding steps are then removed. The exact shape is checked with templates. The resulting fuselage is then filled, preserved, coated and provided with a photo net and sand stripes according to the crack plan. The model is equipped with stern tube and propeller support or rudder propeller gearboxes, propellers, oars, flow plate and other attachments according to the arrangement drawing. Extremely complex geometries are manufactured as CNC-milled or rapid prototyped parts. The installation of measuring instruments for the determination of propeller thrust, propeller torque, nozzle thrust, rudder forces, coupling forces, model resistance – if necessary also the installation of a remote control and data transmission of the measured values for free ride tests – completes the preparation of the model for the test.